Apr 1, 2019 | What Am I Reading? Australian author Melina Marchetta may be best known for her seminal young adult novel Looking for Alibrandi, published in 1992, but she has published nine novels since then. 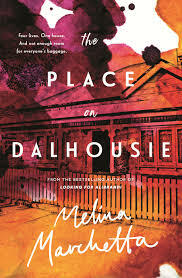 Her most recent, The Place on Dalhousie (Penguin Random House Viking 2019), once again highlights her interest in exploring relationships, families and friendships but does so with a more mature cast of characters, and with the nuanced development that comes with a little age and experience. Marchetta’s common themes of being an outsider and also the slightly magical realism of extraordinary coincidences are also a feature of this novel, which is a moving story about what it takes to make a family, and what is needed to bind a family together. The story opens when spirited Rosie Gennaro meets Jimmy Hailler in the middle of a small, flood-drenched town in Queensland. Rosie has fled her life in Sydney, and her home (on Dalhousie Street) that her father built piece by painstaking piece over twenty years, but never saw completed. She is caring for the cantankerous elderly woman Ms Joy Fricker who refuses to evacuate her home and be put – even temporarily – into the local nursing home. Rosie meets Jimmy – or SES Jesus as she initially calls him – when he comes to their rescue. Jimmy is volunteering with the evacuation team. He is prohibited from returning to his home in Sydney for two years and has had his prized possession, his Monaro, stolen, a deeply disturbing omen for him, especially because the man who had sold him the car in Sydney had told him cryptically that it would help him ‘find his family’, and Jimmy has come north to do just that. Both Rosie and Jimmy are lost souls, unmoored and very much living isolated lives where they depend on only themselves. But within the first few pages, Rosie and Jimmy fall into a casual sexual liaison that is comforting, brief and without strings. Within two weeks, Rosie is gone and Jimmy is forgotten. The book then expands to introduce the third main character, Martha, married to Rosie’s father Seb (after Rosie’s mother died), but now herself a widow. Martha is rattling around in the home that Seb spent all those years building. Estranged from Rosie, and reaching a crossroads in her professional life, Martha is a strong and determined character who finds herself in an impossible position. And when feisty Rosie turns up at her door again, this time with a lot of baggage, the two women are locked into a battle – a fight for the house on Dalhousie Street and a clash of personalities between two women who are both searching for family but are each, for different reasons, frightened of how to find it. Each refuses to move out of the home and it becomes divided into Rosie’s domain upstairs and Martha’s space downstairs. And when Jimmy returns to Sydney and reunites with his group of close friends (all in their early twenties), and decides to find Rosie, things become rather more complicated. I read this as a stand-alone book, however fans of Marchetta will no doubt be delighted to discover that Jimmy and his friends are characters first introduced in her books Saving Francesca and The Piper’s Son. And the characterisation does have an easy and natural feel to it – these are friendships forged on childhood foundations, relationships that have grown and matured over time as the characters struggle to make their way into the adult world whilst maintaining the bonds of their youth. While it may be your introduction to these characters, the effortless and casual vibe between them feels cemented and secure, as if the author is writing about old friends (which of course, she is), old friends who have a history together. This examination of friendship is replicated in the ties between Martha and her girlfriends. Although they are twenty years older, and so in a different phase of their lives, that spark of connection is still there, perhaps made even stronger by experience, shared circumstances and crises overcome. The other similarity with Marchetta’s earlier works is the continued theme of outsiders versus insiders. The positions of migrants – even those that are now second or third generation – are written about with sensitivity and wit, but always with a clear-eyed view towards prejudice, the difficulties of leaving home and the complications of creating a new life in a different country. And the third similarity or theme that readers of Marchetta’s work will recognise is the inclusion of coincidence. In an almost (but not quite) use of magic realism, the characters in this story are united in ways they do not understand and which do not become clear to the reader until the conclusion of the story. These threads of connection are subtle and believable, beautifully-rendered and satisfying. Of course, we think, of course that happens – how could it have been otherwise? And why did we not see it earlier? These lovely coincidences scaffold the heart of the story and strengthen its themes of belonging and yearning. Rosie, Jimmy and Martha are each longing to find – or to create – their own family, or a sense of family, or to recapture the family they have lost, and they discover that family is not only who you are connected to by genetics, but those friends that you choose to be your family because of love. The lives of these characters are all wonderfully messy and flawed and yet Marchetta knits them together with compassion, optimism and hope. The Place on Dalhousie delves deeply into the angst of grief – how we cope (or how we don’t), the strange things grief compels us to do, the barrier grief erects against forming close relationships with others because of our fear of again getting hurt, our protection against further loss. But it also explores the possibility of second chances – of becoming stronger through adversity, of again opening ourselves up to love even though we know the risks. This is an easy-to-read story that emphasises the interconnectedness of lives and the many ways in which people can belong.